Why reinvent the wheel? In February 2011, I provided the following material which was posted on Heneghan's Dunwoody Blog. It received plenty of comments & feedback of all sorts. I just wanted to re-post it here for a refresher and reminder. The same facts and thoughts hold true today. I detailed an actual trail in Walnut Creek, CA -- The Iron Horse Trail. When completed, the trial will span 40 miles connecting two counties and nine communities. Interestingly, the demographics of Walnut Creek & Dunwoody are VERY similar. Yet depending on who you speak with in our town, the support or opposition of Multi-Use trails is very DIS-similar. Below is a photo I took while visiting a friend. 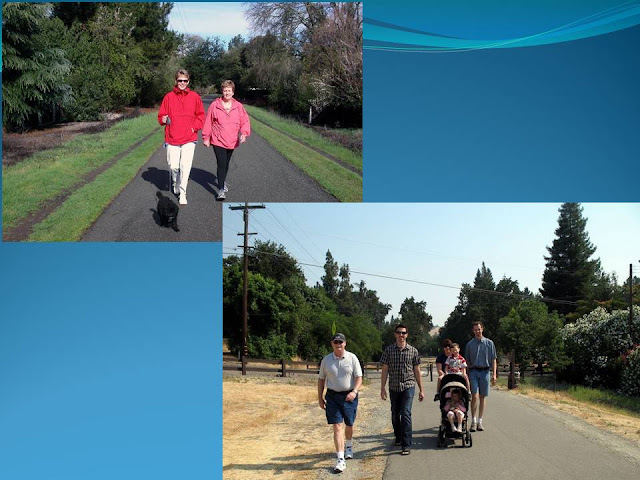 The trail runs along the backyard of her house & her teenage daughters use it to walk into their town -- about 10 to 15 minutes. Notice how "cramped" the trail width is. See the gentleman on the left walking in the dirt. This trail is LESS than 12 feet wide. It's closer to 8 feet. Why is he walking over in the dirt? Because the trail is two-way and there's oncoming joggers, rollerbladers, baby strollers, bicycles, etc...A wider trail will KEEP people on the trail, preventing erosion. Links south to Roswell to the Chattahoochee River and north into Forsyth county, eventually to Lake Lanier. 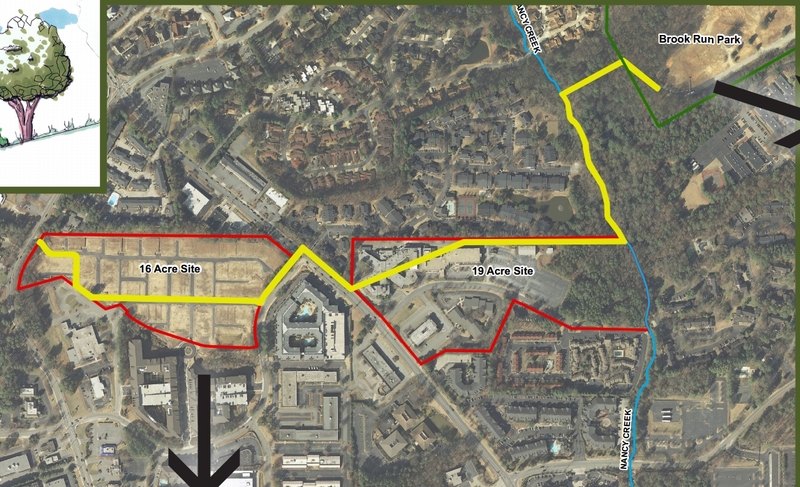 And SINCE my 2011 posting, here's a BRAND-NEW Trail that's going to be built along GA-400 from the Lindberg MARTA Station area north up to the toll booths. 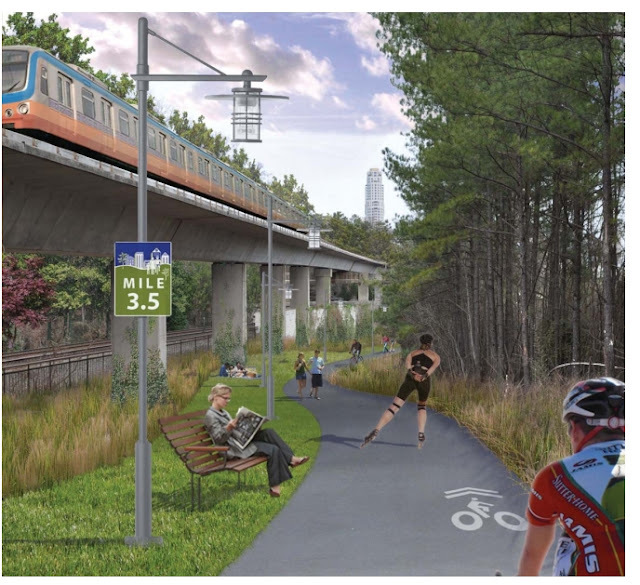 It will connect southward to the Atlanta Beltline. All that's needed is for the City of Sandy Springs to continue building it northward. Dunwoody could build a spur trail to access it.... Just think about that! 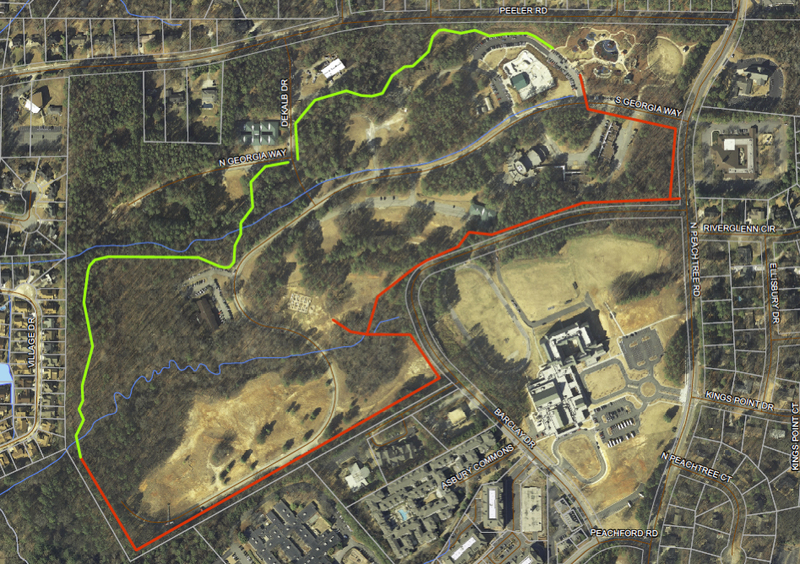 Oh yeah, before I forget, checkout Dunwoody's Brook Run Trail information. We know that life is dynamic Make a plan one year, things change & then the plans can be flexible and adapt, too. 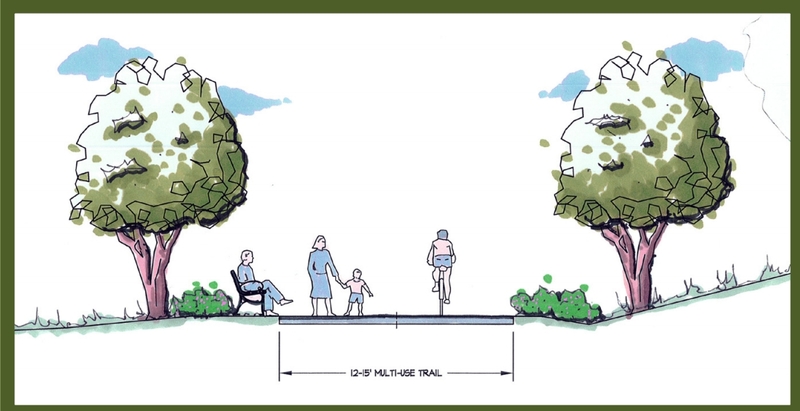 Instead of making a closed loop trail inside Brook Run Park, the city is going to build connecting points over to the Project Renaissance (Old PVC Farm). The city is contractually obliged with John Weiland to build the trails within the project. Then we can create a link to the Brook Run Trails. Also there are future plans to have a Multi-Use trail headed out to the Water Works on Peeler. Then westward over to the Perimeter Center East Park. Nice, eh?? Anyway, for my original 2011 posting, please click HERE & to read the comments.